The 3rd Music Booster meeting of the year has occurred! 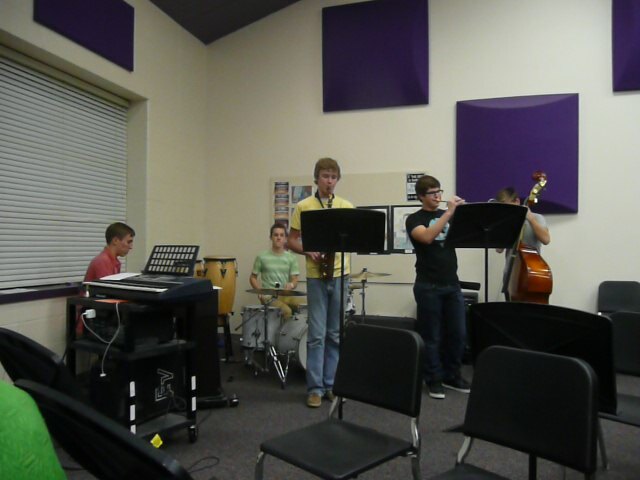 To start our meeting we listened to the smooth sound of Jazz from the “Blue Springs High School Combo” under the direction of Nathan Wilhoit at Sunny Vale Middle School. It was a real treat getting a glimpse of what our high school talent is all about! We applaud them for their love of music and for sharing their talents with us! On Monday, April 8th at 6:30pm (our final membership meeting of the year), WE WILL BE VOTING IN NEW OFFICERS; meeting location to be announced. It is vital that we have as many of our membership present as possible. (Please see note below.) Please put this date on your calendar as we need YOUR participation to truly make this a beneficial organization to our students and teachers! Instrument purchases for schools – The Boosters have helped obtain a Metallophone for Sunny Point Elementary School and a Korg Stage Vintage Piano for Sunny Vale Middle School! We still have money in the budget to handle more requests from schools. Membership – We are still working to build our membership and awareness of Music Boosters. Help us to spread the word. Sing Fest – We will need volunteers to help on April 29th. Three Board Members are stepping down (VP fundraising, Secretary, and Treasurer) – Please consider volunteering to help with Music Boosters in these roles. If we aren’t able to find replacements, Boosters may not be able to continue to function. Please contact your teacher or any of the existing Board members before March 31 if you are interested!